When guest molecules cover a solid surface (adsorption process), they induce noticeable stresses to the surface and causes its elastic strain. 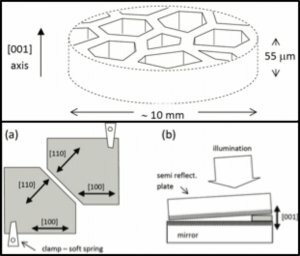 The nanoporous materials, the surface of which is very big (until 1000 m2/g) are particularly sensitive for that purpose with deformations being able to reach the breaking point of stiff porous solids and modify of about 30% the volume of soft porous solids (aerogels with porosity higher than 97%). The fundamental understanding of the mechanical aspects and thermodynamics of this adsorption-deformation coupling and of its possible role in the evaporation process of fluids confined to nanopores (original idea developed in INSP) is the subject of numerous studies. 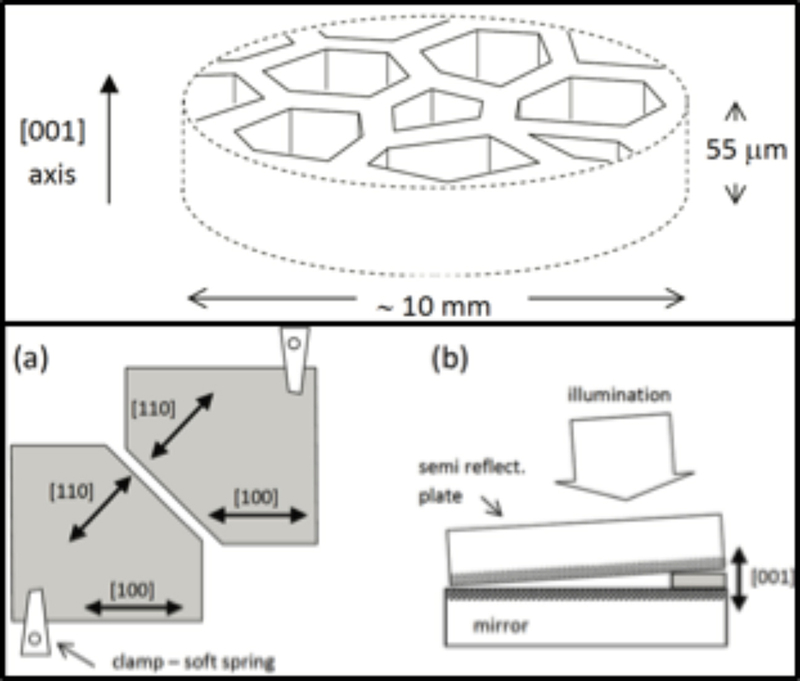 These rely on the significant progress in the manufacturing of structured and better characterized nanoporous solids, but face first of all the difficulties to measure the mechanical properties at the nanometric scale of anisotrope solids. In this context, the searches led to the INSP in collaboration with a team of the ENS [3 ] have just ended for the first time in the complete characterization of the elastic coefficients of a nanoporous matrix, the porous silicon, which is a realization in an unusual, nanometric scale, of a disordered honeycomb-like structure. This study also strick evidence of finite-size effects and of a strong contribution of the elastic effects of surface to the energy of the solid-fluid system. Our coupled experiences of high-resolution optics and adsorption showed the reality of elastic strains (ε) of porous materials with a hysteresis loop in the same pressure range as that of the adsorption phenomenon . In the saturation regime where the pores are full of liquid at pressure PL (< 0), the measurement of the pore-load modulus, M=dPL/dε, could yield the effective elastic modulus of the walls forming the solid matrix, provided that the pore geometry is known. However, for porous materials, where both pores and walls have nanometric sizes, this approach give rise to preliminary fundamental issues to which we dedicated our first searches. First, our studies of molecular dynamics indicate that the stress due to the liquid confined in nanopores can be described by a simple isotropic pressure in pores, obtained by a macroscopic thermodynamics. This result allows us to derive, for the first time, the whole set of elastic coefficients, except the shear modulus, for porous silicon, in the framework of the macroscopic approach of poromechanics. Second, the quantitative comparison of these coefficients with results of Finite Element Modeling of the pore geometry, derived from transmission electron microscopy, allowed us to show that the values of the elastic moduli are consistent with the picture of a honeycomb structure, provided that the Young’s modulus of the silicon walls is approximately 6 times smaller than that of bulk silicon. It is the first time that such a huge reduction is observed but it is not completely surprising for walls 5 nm thick ; a factor 3 was already reported for nano-cantilevers 12 nm thick . Schematic view of a disordered honeycomb-like structure. 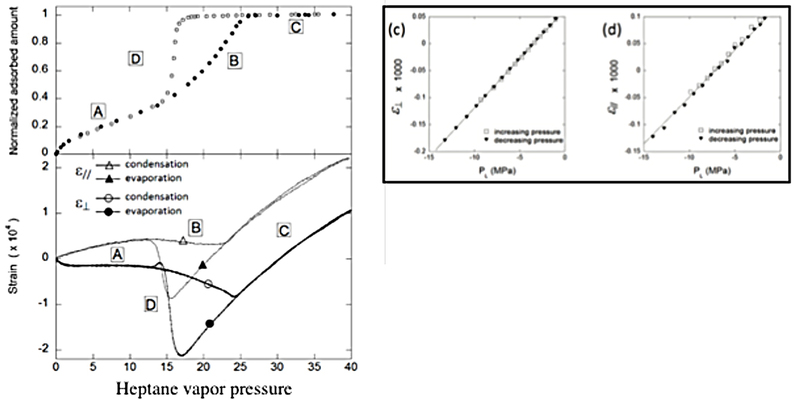 Setups of measurement of (a) transverse and (b) parallel (to the pore axis) adsorption-induced strains in porous membranes. (a) one measures the slit width between 2 membranes as a function of the vapor pressure. (b) an interferometric setup in an air-corner geometry is used to measure the shift of the interferences fringes due to changes of the wedge’s angle induced by parallel strains. Left : Cycle of adsorption/desorption isotherms (18°C) and induced-strains, measured in porous silicon membranes as a function of heptane vapor pressure. When the pores are filled with the liquid phase, the capillary forces induce linear elastic strains, transverse (c) and parallel (d) to the  pore axis. These results indicate the existence of finite-size effects and of a strong contribution of the elastic effects of surface to the energy of the solid-fluid system. From now on, they raise a new question : could the thermodynamics of the deformable solid-liquid interface play an important role in the adsorption phenomenon and in the evaporation process in particular [7,8] ? Whatever is the answer, a better understanding of the adsorption-deformation coupling will allow to anticipate and to check its practical consequences observed in numerous industrial domains. We can quote for example the degradation of the hydraulic permeability of mineral membranes developed for the nanofiltration of pollutants of underground waters. 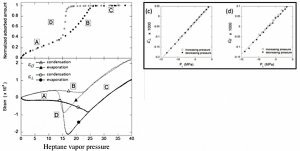 A. Grosman and C. Ortega, Adsorption, Cavitation and Elasticity in Mesoporous Materials in NonLinear Elasticity and Hysteresis, pp. 27-56, Wiley-VCH Verlag GmbH&Co, KGaA2014. G. Y. Gor, P. Huber and N. Bernstein, Appl. Phys. Rev., 4, 011303 (2017). E. Rolley et N. Garroum, LPS de l’ENS. A. Grosman, J. Puibasset and E. Rolley, EPL 109, 56002 (2015). X. Li, T. Ono, Y. Wang and M. Esahi, Appl. Phys. Lett., 83, 3081 (2003). A. Grosman and C. Ortega, Phys. Rev. B, 78, 085433 (2008). A. Grosman and C. Ortega, Langmuir, 27, 2364 (2011).